Just in time for International Women's Day, American Express Co. (AXP - Get Report) agreed this week to disclose the pay differences between their men and women by the end of 2018, becoming the seventh financial company this year to adopt such a proposal following pressure from Boston-based investment company Arjuna Capital. At the center of the initiative is one of Arjuna's co-founders, Natasha Lamb, 35, who began her gender pay gap campaign in Silicon Valley in 2015, initially targeting Intel Corp (INTC - Get Report) . Since then, she's gone on to persuade companies including Action Alerts Plus holdings Apple Inc. (AAPL - Get Report) , Amazon.com Inc. (AMZN - Get Report) and Microsoft Corp. (MSFT - Get Report) to make pay-gap disclosures. Now, she's almost wrapped up her campaign with some of the biggest banks and finance companies, many of which have a majority of women as employees. American Express joined Action Alerts Plus holding JPMorgan Chase & Co. (JMP - Get Report) , MasterCard Inc. (MA - Get Report) , Bank of America Corp. (BAC - Get Report) , Wells Fargo & Co. (WFC - Get Report) , Bank of New York Mellon Corp. (BK - Get Report) and Citigroup Inc. (C - Get Report) in agreeing to publicly disclose efforts to address gender pay inequity. All that's happened since the start of the year, after Lamb's efforts were largely rejected in 2017. "The American Express agreement on gender pay equity completes the group of seven leading banks and credit card companies that we engaged on behalf of shareholders this year," Lamb said in a statement. Still holding out are two insurance companies, Reinsurance Group of America Inc. (RGA - Get Report) and Progressive Corp. (PGR - Get Report) , Lamb said in a recent interview. Lamb said she will be working with another Progressive investor who has also filed a gender pay proposal. Next on her list are various campaigns at companies including Walmart Inc. (WMT - Get Report) , Facebook Inc. (FB - Get Report) , Twitter Inc. (TWTR - Get Report) and Google where her efforts will focus on issues including gender pay inequity, fake news and sexual harassment. In the meantime, it's been a productive year with the banks. "Last year, I would have loved to have seen what we saw this year," Lamb told TheStreet. "When we started to engage Wall Street in the fall of 2016 going into the 2017 proxy season, we were met with a lot of resistance and it was clear that if one bank wasn't doing something, none of the others were going to do it." In fact, when she presented her proposal at Citigroup's annual meeting in New York City in April last year, she had what she called a "back-and-forth" with another shareholder and Citi Chairman Michael O'Neill and wound up getting rejected. Bank of America, MasterCard, America Express, JPMorgan and Wells Fargo also nixed her plans. But a year later, after the #MeToo and Time's Up movements, the Women's March on Washington and the unveiling of the Fearless Girl statue on Wall Street, things have changed. 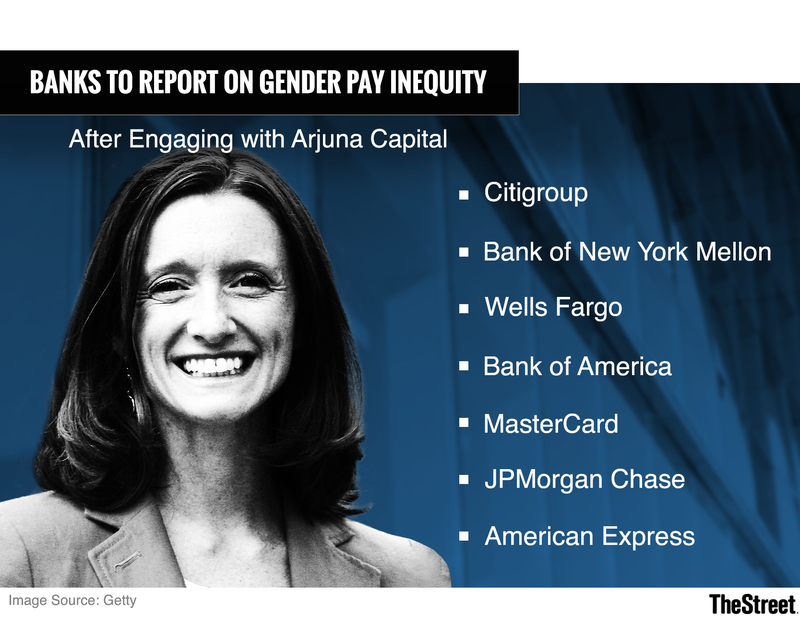 In January, Citigroup had "a huge about-face," and was the first in the group of targeted financial companies to agree to disclose wage data and adjust employee salaries to achieve gender pay equity, Lamb said. The other six banks and credit card companies followed suit in a matter of weeks. "It always takes the first company to make a move and it's remarkable that was Citigroup," Lamb said. The catalyst for this change is "simply momentum," said Robert Voth, who co-leads executive firm Russell Reynolds Associates' Consumer and Commercial Financial Services Practice. "This will catch fire across all industries." Since prominent companies have moved forward on the issue of pay equity, those that haven't will face shareholder proposals at their annual meeting, Lamb said. "The laggards are in a position where not only are they at a competitive disadvantage in their ability to attract and retain top female talent but they are going to get higher and more sustained shareholder pressure to address the issue," Lamb said. Even though Intel and other tech companies have proved amenable to her proposals, she's still working on proposals at companies including Texas Instruments Inc. (TXN - Get Report) and Facebook. Facebook's hold-out is especially surprising since chief operating officer Sheryl Sandberg is also the founder of non-profit organization LeanIn.org., which is dedicated to empowering women to achieve their ambitions. "It's disappointing, remarkable and appears flatly hypocritical," Lamb said about Sandberg. Facebook declined to comment. Women remain significantly underrepresented in the corporate pipeline, according to the 2017 Women in the Workplace study conducted by consulting firm McKinsey & Co. and LeanIn.Org. "From the outset, fewer women than men are hired at the entry level, despite women being 57% of recent college graduates," the study found. "At every subsequent step, the representation of women further declines, and women of color face an even more dramatic drop-off at senior levels. As a result, one in five C-suite leaders is a woman, and fewer than one in thirty is a woman of color." In the banking and consumer finance industries, women represent 51% of the entry-level positions, a level that falls to 36% at the Senior Manager/Director level, and drops to 18% in the C-Suite, according to the Women in the Workplace study. More broadly, women earn only 83% of what men earn in the U.S. when considering both full-time and part-time positions, analysts at Bank of America Merrill Lynch highlighted in a March 7 research note, citing 2016 data by Pew Research Center. "I actually found out after starting to engage with the companies that financial advisors, which is what I am, have the largest gender pay gap of any occupation in the U.S. and that's 62 cents on the dollar," she said. Still, focusing just on the numbers misses the greater issue, Voth said. "Wholesale and evolutionary change will come from hiring female executives one and two down [from the C-Suite/Board level] and missing that opportunity to ensure a robust pipeline is a massive fail," Voth said. Voth said outdated evaluations are restricting companies from establishing a robust pipeline of female talent. "Legacy leadership evaluations fall far short of current demands," said Voth. "The characteristics of leadership evaluations were formed decades ago based upon a static view of leadership that was made to select, not develop, and therein lies the issue. Hiring executives must free themselves from outdated assessment and allow themselves to hire upon both quiet and loud attributes."